A lot of times, it is best to objectively analyze the situation at hand. This is very helpful because it helps you to properly ascertain the best possible line of action. When you are able to analyze the situation then you will find it easy to read the moves of a fake person. When a proper analysis is done, you will be in total control of your body, as well as, your mind. With this kind of control in place, you can successfully turn the tables on fake people. 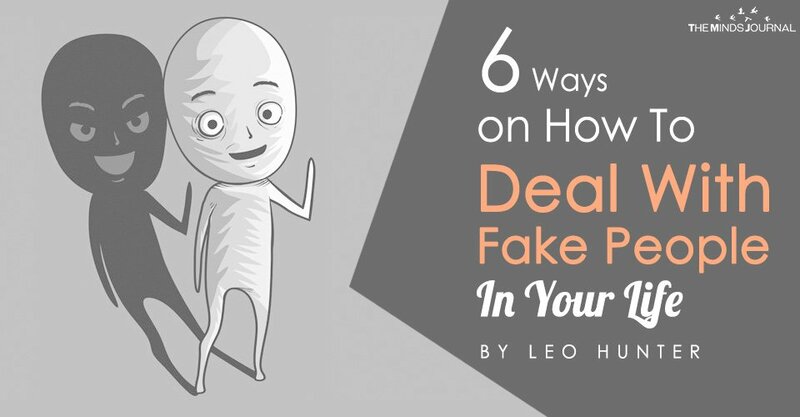 This is a great tool that can be properly applied when it comes to handling fake people. You need to limit your interactions with them. This is a crucial step that you may need to take. The other tips can be used effectively if you learn to use distance to your own advantage. If someone’s goal is to make you feel sad, then it is best to avoid that kind of person. 6. Express your appreciation for genuity. This is a great way to take matters into your hand. You can benefit from the advantage when you consistently express how much you value genuine people. When you make it a habit to constantly talk about how much you want to be surrounded by authentic people then you will throw the “fakes” off. When you do this, it will either cause the person to stop acting fake or have them totally avoid you altogether. Either way, it is a win-win situation for you. One thing that fake people always think they have on you is the fact that they are your “friends”. However, when you make it an effort to make new friends then it will be uneasy for fake friends to hold you “rampage”. You can take advantage of the fake people by cutting them off and focusing on people who are good for your physical and mental well-being. It is important for you to recognize the fact that not every friend is genuine. This will help you to pay attention to the important details. Fake people often find new ways to get attach to you. This makes it almost difficult to get rid of them. However, you can successfully do away with them. More importantly, you can change the status quo and ensure that you stop being the victim. It is never right for you to deal with people that cause you to feel annoyed or disrespected. This is why you need to ensure that you do not let fake people have the upper hand. If you follow these tips actively then I am sure that, like me, you will see amazing results. Jay runs &amp;lt;a href=&amp;quot;https://www.greatbigminds.com/&amp;quot;&amp;gt;Great Big Minds&amp;lt;/a&amp;gt;. In his blog, he shares life-changing inspirational content with the world. He lives to empower, inspire and motivate others to live life great and go after their passion. You can &amp;lt;a href=&amp;quot;https://www.greatbigminds.com/about-us/&amp;quot;&amp;gt;connect and learn more about him here&amp;lt;/a&amp;gt;.